Buffalo Suzuki Strings Musical Arts Center today. color and have faithfully reproduce the suspended lighting fixtures and Corinthian columns. significant for the use of electrical arc welding in its construction and for Green’s innovative use of commercial office space. 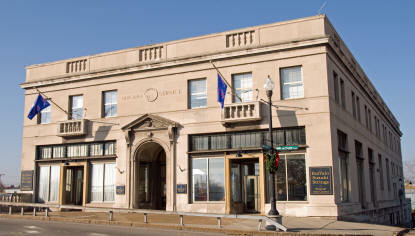 The massive structure was originally constructed to headquarter the Tonawanda Power Company (later Niagara Mohawk) and the State Trust Company Bank (later Marine Midland and HSBC). The Niagara Service Building, as it was formally called, was opened with great fanfare on March 2, 1929.
bridge”. Matthew Scanlon was a presitigious North Tonawanda businessman and New York State Senator. The original three story frame building housed Scanlon Hall on the top floor, the Seamen’s Hotel on the second floor, as well as a saloon. The Seaman’s Hotel offered room and board to sailors passing through on Great Lakes vessels. The “Long bridge” was hit by canal barges during a March 1916 flood and rebuilt. The new bridge was named the Bascule Bridge.